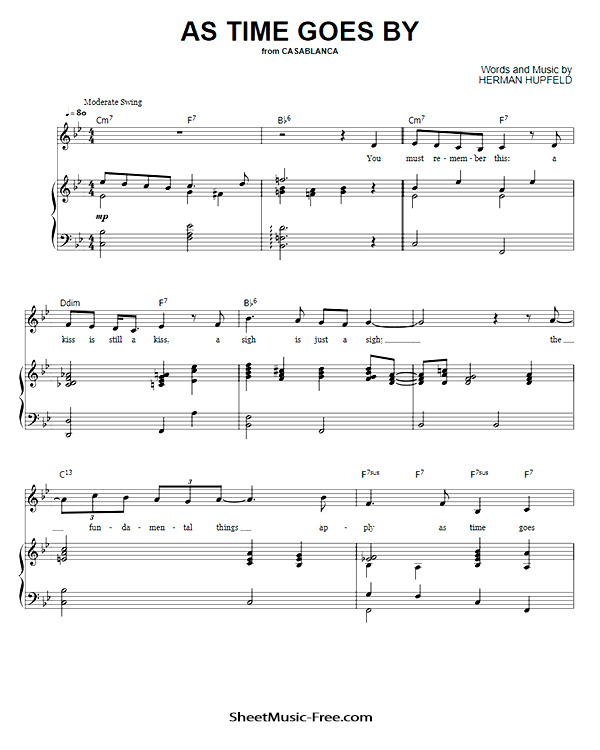 “As Time Goes By Sheet Music” by Casablanca, “ As Time Goes By Sheet Music” for Piano, Original key: C Major, number of pages sheet music PDF: 3, Video and Lyrics song As Time Goes By Sheet Music. “As Time Goes By’” is a song written by Herman Hupfeld in 1931. It became most famous in 1942 when part of it was sung by the character Sam (Dooley Wilson) in the movie Casablanca. The song was voted No. 2 on the AFI’s 100 Years…100 Songs special, commemorating the best songs in film. The song has since become the representative song of Warner Bros. and was also the title and theme song of the 1990s British comedy series As Time Goes By. As Time Goes By Sheet Music Casablanca. There’s no one can deny.